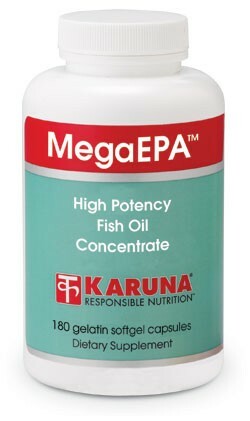 MegaEPA provides the highest omega-3 fatty acid (EPA, DHA) concentration of any fish oil supplement commercially available, and research has shown EPA and DHA to specifically help maintain healthy blood pressure, blood lipid levels, platelet dynamics, and cardiac rhythm, all of which support cardiovascular health. As a result, the American Heart Association recommends regular intake of omega-3 fatty acids from fish to all people, and advises patients with heart disease to consider fish oil supplements. EPA and DHA also favorably enhance the balance of prostaglandins, thromboxanes, and leukotrienes to promote the health of numerous tissues and organ systems. MegaEPA is a refined concentrate of natural marine oils which are a rich source of cholesterol-free polyunsaturated omega-3 fatty acids as stable esters. MegaEPA provides the highest omega-3 fatty acid concentration of any fish oil supplement commercially available. Suggested use for adults: 2-6 capsules daily, in divided doses with meals, or as directed. It is recommended that people who take MegaEPA also supplement vitamin E in order to protect against oxidative damage.